School teacher and author, Tracie Cook, has created and published an amazing guide - this one for the children, not for the parents. Tracie has also penned Kids Tips for Walt Disney World: Touring Advice by Kids for Kids and though I haven't read that one, after reading her newest book, I'm sure that one is fantastic as well. 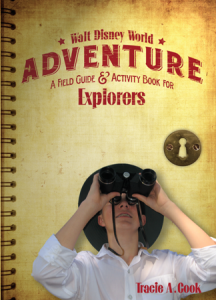 Walt Disney World Adventure: A Field Guide and Activity Book for Explorers is Tracie's newest publication and I am excited to have the chance to complete the activities review this book myself. For anyone who has ever said that a vacation to WDW isn't an educational experience, this book is proving you wrong. For every park and, as far as I can tell, for every attraction/ride, there is an activity connected. With the obvious learning opportunities like the Hall of Presidents there are trivia questions along with fill in the blank answers, so kids of all ages can learn new and interesting facts related to the ride. Such as "I was the first president to live in the White House" with the answer being J hn d ms. My husband probably knew that, but I definitely didn't know that off the top of my head! Filled with too many different puzzles, games, logic problems (another one I had to complete! ), and many Explorer Challenges, this book should make any parent feel less guilty about pulling their children out of school for a couple of days for their family vacation. I have thoroughly enjoyed reading through this book and I am SO impressed with what Tracie has put together. I highly recommend this book to anyone taking their older children (10-12, but suitable for approximately 8-14) to the parks. I know my 6 year old nephew will be receiving a copy before his next trip in a couple of years!! To learn more about Walt Disney World Adventure: A Field Guide and Activity book for Explorers and continue your adventures, check out Tracie's website, follow her on Twitter (@WDWFieldGuide), or find her on facebook. Find her books available for purchase on amazon. Though a copy of the book was provided for review from the author, I have put forth only my true opinions into this review. Sounds like a wonderful way to make an educational, yet still fun experience out of a family vacation.